We’re having another set of twins, and we need your help naming and creating the artwork for them! The Purple Line Extension, Section 2 Tunnel Boring Machines (TBMs) will be digging the two parallel tunnels between Beverly Hills and Century City. Traditionally, TBMs cannot start work until they are given names. TBMs are generally named after women as a sign of good luck for the project ahead. History shows that tunnellers looked to Saint Barbara for protection; she is the patron saint for military engineers, miners and others who work underground. Before sending our TBMs along their journey into the earth we also like to adorn them with special artwork that is representative of the local community they will be tunneling under. Follow the links to vote for your favorite art and names for the tunnel boring machines! Follow the @PurpleLineTBMs on Twitter for weekly updates on their progress and more. 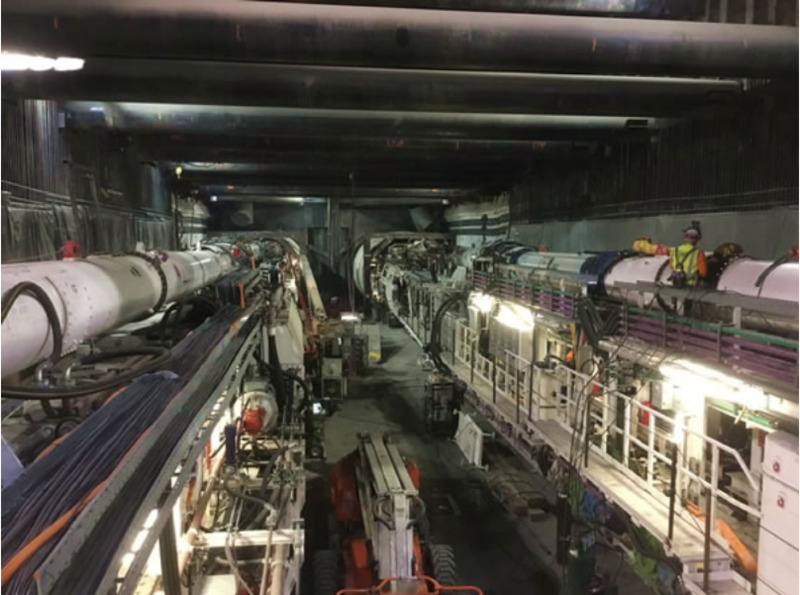 Elsie and Soyeon, the twin Tunnel Boring Machines (TBMs) for the Purple Line Extension Section 1 are currently digging two parallel tunnels that will connect three new stations between Koreatown and Beverly Hills. They started their tunneling journey Fall 2018 at Wilshire/La Brea Station in Miracle Mile and will continue towards Wilshire/Western Station in Koreatown. Once the current Purple Line terminus, they will be dissembled for transporting back to Wilshire/La Brea Station and then reassembled for the last leg of their journey through Wilshire/Fairfax Station and finishing at Wilshire/La Cienega Station in Beverly Hills. The Purple Line Extension is currently looking for names and artwork to adorn the Section 2 TBMs. The Section 2 TBMs will start their tunneling journey from Century City/Constellation Station and head east towards Wilshire/Rodeo Station in Beverly Hills and link up with the Section 1 tunnels at Wilshire/La Cienega Station. For more information about the TBMs check out the fact sheets. The Purple Line Extension Section 1 Tunnel Boring Machines (TBMs), Elsie and Soyeon, are currently digging under Wilshire Bl. They will construct two parallel tunnels to create a seamless connection from the current Purple Line terminus at Wilshire/Western Station in Koreatown to three new stations located at Wilshire/La Brea, Wilshire/Fairfax and Wilshire/La Cienega. Elsie and Soyeon are responsible for building 17,845 linear feet of tunnels to create approximately 3.9 miles of new subway. They are currently on their way to completing Reach 1. As of tradition, the TBMs for Section 2 of the Purple Line Extension will be affectionately referred to as “The Twins” until they receive names through the Art and Naming Contest . The Twins will be building the connection between the Wilshire/La Cienega and Wilshire/Rodeo Stations in Beverly Hills and the Century City/Constellation Station in Century City. They will build approximately 2.6 miles of new subway and will be creating 13,630 linear feet of tunnels. The twins are expected to start tunneling Fall 2019. Along the way, TBMs will encounter different soil conditions. The tunnel crown will always be at least 20 feet or more under the subsurface water table. In terms of geology, tunnels will be bored through two types of geological formations: San Pedro and Fernando. Progress is measured in total linear feet traveled. Please use the materials below to learn more about the Purple Line Extension Tunnel Boring Machines (TBMs).